Bono has been remembering Lou Reed, for the new edition of Rolling Stone. The world is noisier today, but not the kind of noise you want to turn up. The world of words is a little quiet and a good bit dumber, the world of music just not as sharp. Lou Reed made music out of noise. The noise of the city. Big trucks clattering over potholes; the heavy breathing of subways, the rumble in the ground; the white noise of Wall Street; the pink noise of the old Times Square. The winking neon of downtown, its massage and tattoo parlors, its bars and diners, the whores and hoardings that make up the life of the big city. New York City was to Lou Reed what Dublin was to James Joyce, the complete universe of his writing. He didn't need to stray out of it for material, there was more than enough there for his love and his hate songs. From Metal Machine Music to Coney Island Baby, from his work in the Velvet Underground to his work with Metallica, the city that he devoted his life to was his muse more than any other. Until Laurie Anderson came into his life 20 years ago, you could be forgiven for thinking that Lou had no other love than the noise of New York City. If he thought people could be stupid, he thought New Yorkers were the smartest of them. We first hooked up on the Amnesty International Conspiracy of Hope tour in 1986. He would talk guitar sounds with Edge, motorcycle sounds with Larry, James Joyce with me and - maybe I'm remembering this wrong - relationships with Adam. On one occasion, in perfect Lou drawl, he described how annoyed he was for agreeing to lend one of his motorcycles to his girlfriend. She had a small accident, damaging the lowrider in ways that clearly upset him. I asked him how his girlfriend was after the accident. He looked at me dryly and said, "Bono, you can replace the girlfriend." His deadpan humor was easily misunderstood as rudeness, and Lou delighted in that misunderstanding. For the purposes of the hotel register, his pseudonym at the time was Raymond Chandler. I asked him what he liked about the noir genius of the detective story. "Biting humor and succinctness," he replied. I asked him for an example: "'That blonde is about as beautiful as a split lip.' It doesn't get better than that." He laughed loudly. Lou exemplified the idea of art as the discovery of beauty in unexpected places. One of his most famous songs, "Perfect Day," is made even more perfect by being about a heroin addict walking through the park in the warm sun, completely separate from the problems that brought him his addiction. It's been sung by all manner of earnest voices, including mine and children's choirs, since it was written in 1972. It never fails to give me some kind of extra ache as they sing the last line, "You're going to reap just what you sow," oblivious of the icy chill suggested. Transformer was the album that turned me on when it was released in 1972. Myself and my best friend Guggi would sit for hours listening to these street stories, thinking we knew what it was to walk on the wild side. We were 12 and 13. Transformation is at the heart of Lou Reed's best work: people's ability or inability to transform. We know that turning pain into beauty is the mark of a great artist and we understand defiance is at the heart of romance, but we are mystified by how Lou Reed's songs are so airborne. Helium-filled metal balloons, never weighed down by their subject matter, humor always around the corner from vitriol. Magic and loss, indeed. Lou Reed was an alchemist, turning base metals into gold, heavy metal into songs as disciplined as if they came from the Brill Building - which they did, because that is the world where Lou got his start. Lou was born out of two influences that can't be underestimated. One: the talents of his bandmates in the Velvet Underground, who then influenced pretty much every group that had a foot in the Seventies. (Witness our own "Running to Stand Still" for red-handed proof.) 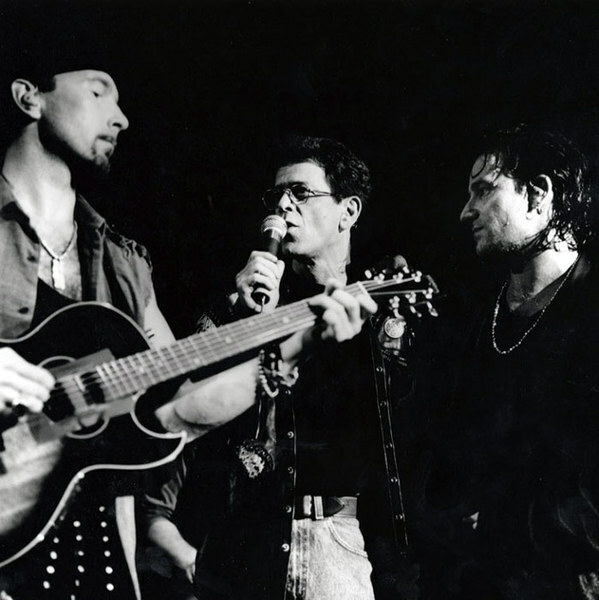 U2 were beyond ourselves with delight when the Velvets re-formed to play some select dates in the early Nineties, including some with us. "Pale Blue Eyes" is perfection in pop. Two: the short-story writer Delmore Schwartz. Lou would return to this subject a few times with me and got me to read In Dreams Begin Responsibilities. (I did and they do.) He also got me a collection of essays, The Ego Is Always at the Wheel. (It is and I know.) I got him a collection of Seamus Heaney poems a couple of months back. Our last conversation was a simple thanks. The music is eternal. It will keep being made even without him. It was wonderful to see Lou reunited with Bob Ezrin on their Berlin: Live shows in 2006, and to know that his beloved neighbor Julian Schnabel was set-designing and filming. I think it was originally meant to be rock opera for stage rather than screen. Maybe that will happen now, as the world digests how serious a loss we've just sustained. It's too easy to think of Lou Reed as a wild creature who put songs about heroin in the pop charts, like some decadent lounge lizard from the Andy Warhol Factory. This couldn't have been further from the truth. He was thoughtful, meditative and extremely disciplined. Before the hepatitis that he caught as a drug user returned, Lou was in top physical condition. Tai chi was what he credited for his lithe physicality and clear complexion. This is how I will remember him, a still figure in the eye of a metallic hurricane, an artist pulling strange shapes out of the formless void that is pop culture, a songwriter pulling melodies out of the dissonance of what Yeats called "this filthy modern tide" and, yes, pop's truly great poker face - with so much comedy dancing around those piercing eyes. The universe is not laughing today. Satellite's gone up to the skies. Thank you for a great insight into an amazing influential artist. Nice piece from Bono on the late great Lou. U2 introduced me to Lou back in the early 80's with references to his many great songs weaved into U2 classics, specifically Bad at Live Aid-who can ever forget that magical day where our boys stole the show? And so fade away, let it go......I'm not sleeping. RIP Lou.